Hi guys! Another ramen recipe is here~!! This creamy chicken ramen, Paitan Tori Ramen is a new trendy style ramen in Japan that you don’t want to miss!! Creamy chicken ramen is very tricky to make and I will teach you the easiest way to make for you guys!! 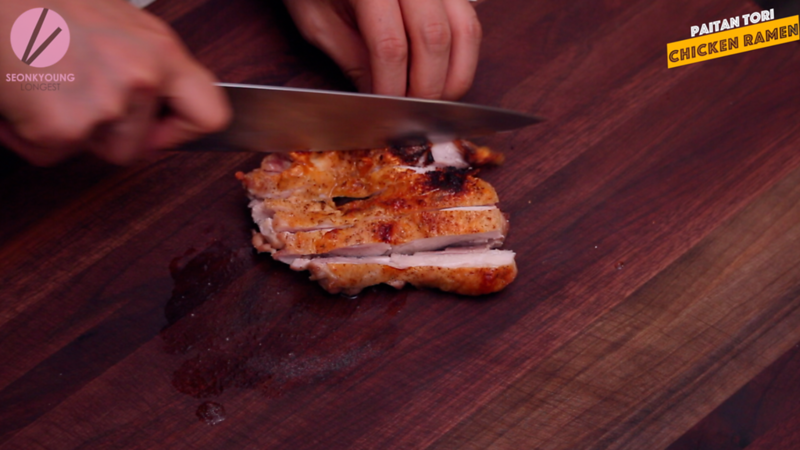 First thing is first, let’s cut up our whole chicken! Make sure sharpen your knife for easier process! 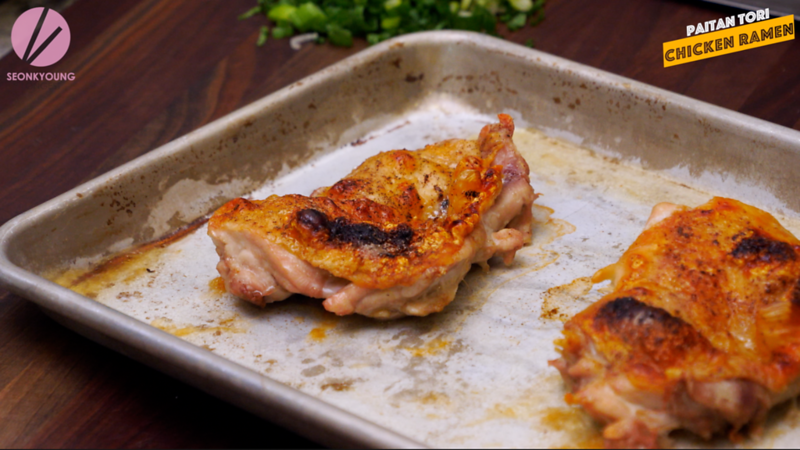 With the chicken backbone side up, pull each wing away from the body, cut through joint and detach the wings completely. 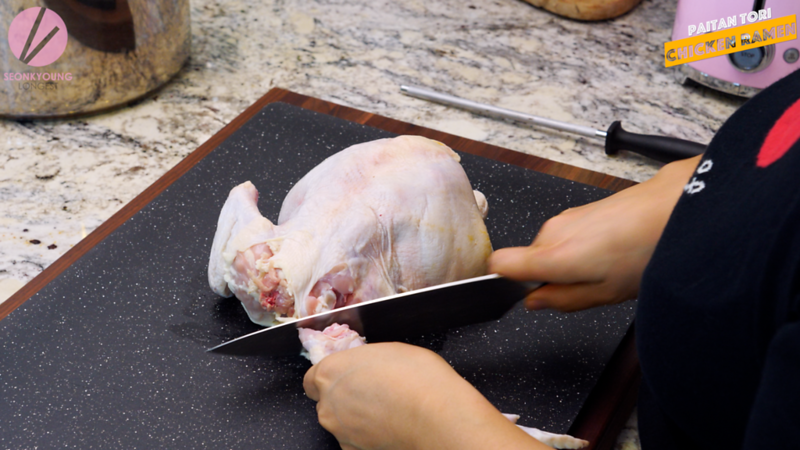 The chicken breast side up, pull each leg away from the body, then slice through skin between the breast and the drumstick. Bend each thighbone until pops and cut through to detach the legs completely. To debone the breast meat, find the highest part of the breast, using tip of your knife, cut lengthwise into the highest part of the breast. Cut along one side of the breastbone and separate the meat from the bone. Same thing to the other side. Remove skin, set aside. To debone the leg and the thigh, place the leg and the thigh skin side down. Shallow slice the middle to open the meat and keep slicing both side of the bones. When you can see the bones clearly, place your knife underneath of the thigh bone cut outwards to detach the bone. Same thing to the leg bone. 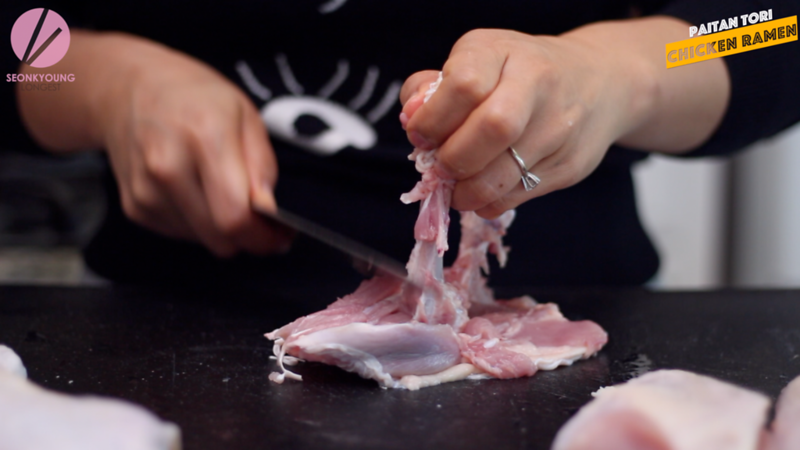 Carefully detach the joint of thigh and the leg bone without cutting though the meat or skin. 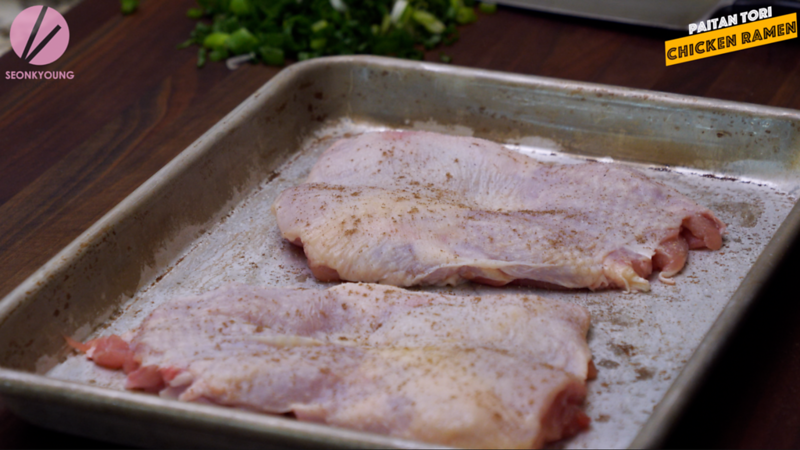 Cover the leg meat with a plastic wrap and keep it in a refrigerator until ready to use. Cut through the rib cage and then shoulder joints to separate breast bones from back bones. 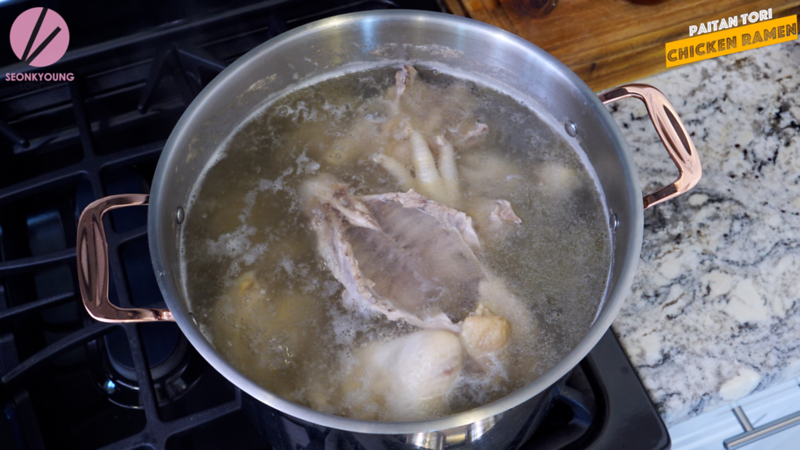 Place the back bone, the breast bone, the wings, the leg and the thigh bones to a large pot along with chicken feet and extra back bones. 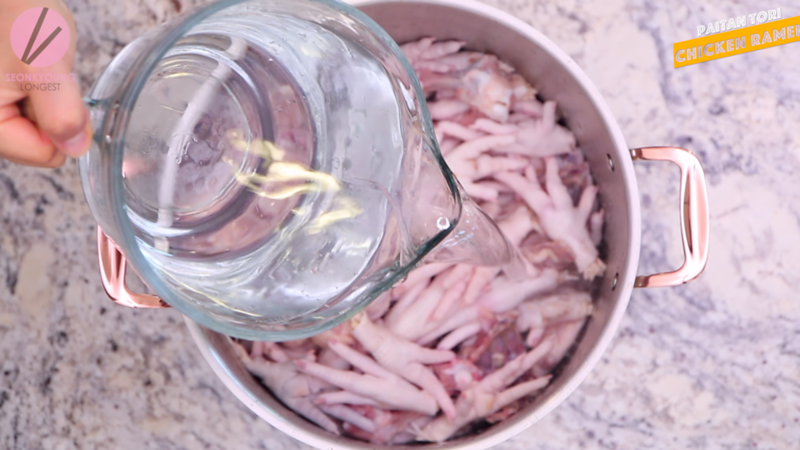 Pour enough cold water to cover the bones and let it soak for 30 mins. Drain and rinse one more time then drain completely. 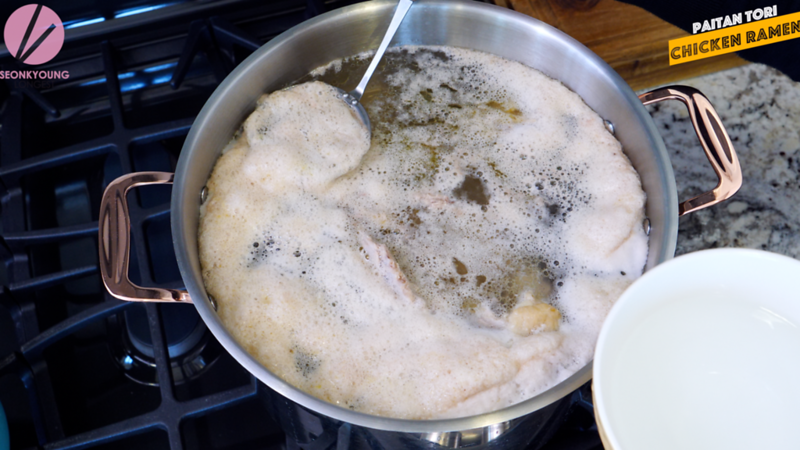 Now, pour 25 cups water and 1 cup sake to the chicken and bring it to boil over high heat. When it starts boiling you will see lots of scums and dirty foams, so skim out all. It will takes about 10 to 15 minutes. 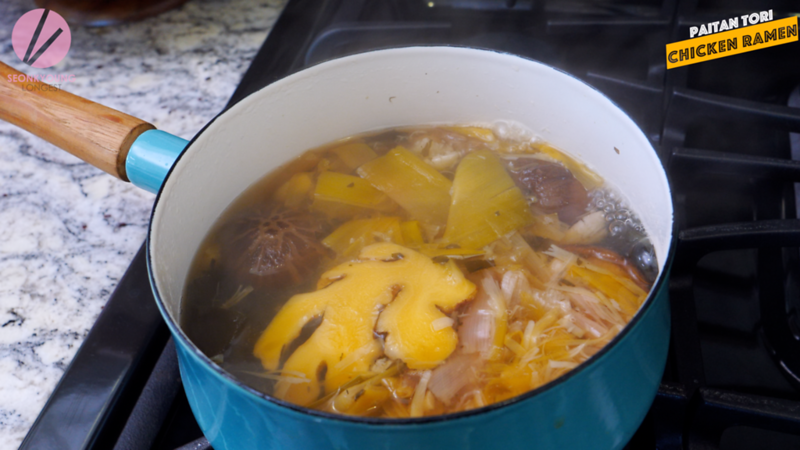 Reduce heat to medium, cover and let it simmer for 5 hours. After 3 hours by, start smashing the bones with a potato masher every 30 minutes. 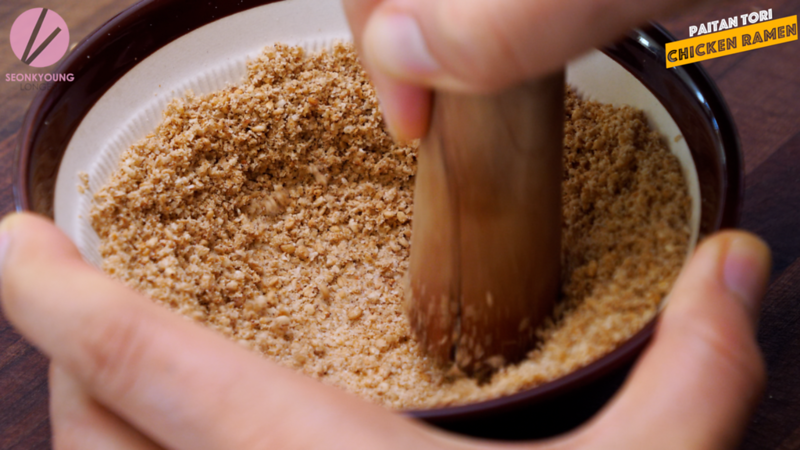 Meanwhile, let’s make tare, the seasoning sauce for the ramen! 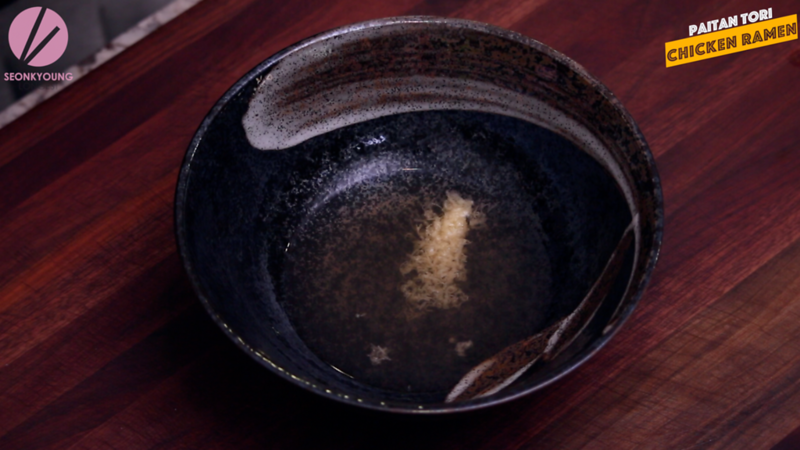 Place kombu, garlic, ginger, white part of a leek, salt, sugar, water and sake in a pot. Bring it boil over high heat. Let it hard boil for 10 minutes then reduce heat to medium, cover and simmer for 1 hour. Drain through a fine strainer and squeeze all the juice out form the veggies. 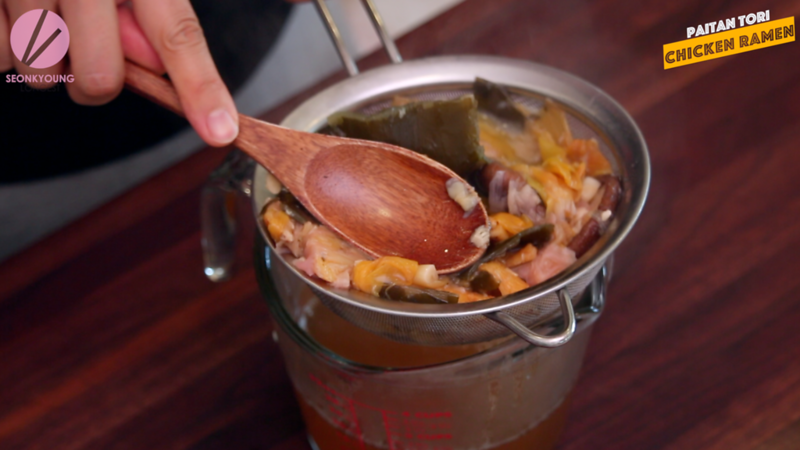 This is shio tare (salt tare) and if you want to make spicy tare as well, add 4 tablespoons of guchugaru to the half of tare in a separated bowl. 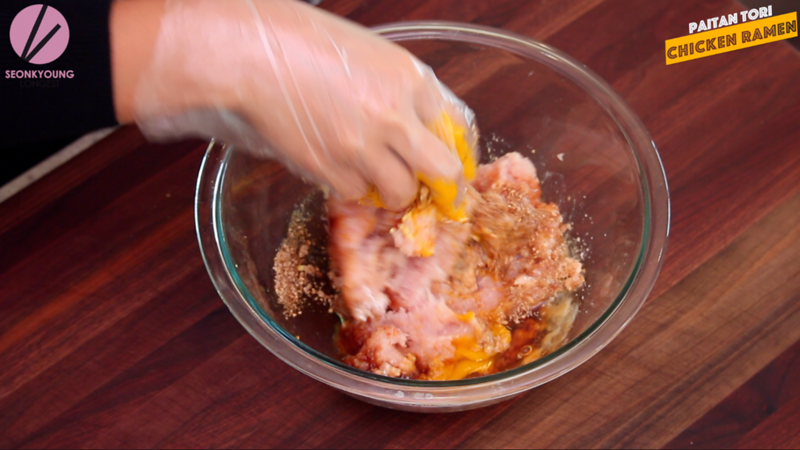 To make chicken meatballs, cut chicken breast into a rough chunks and place in a food processor with butter. 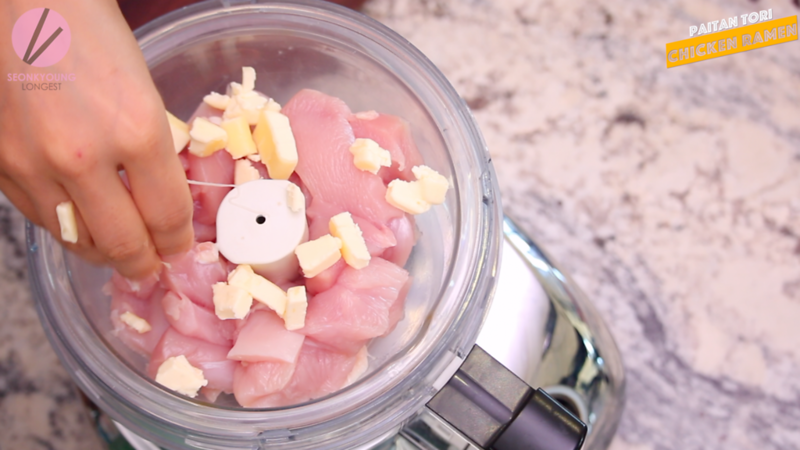 Pulse 8 to 10 times or until the chicken is finely ground and butter has incorporated well. Transfer ground chicken to a mixing bowl, and add garlic, ginger, starch, soy sauce, mirin, black pepper, egg and ground sesame seeds. To ground sesame seeds (ALWAYS TOASTED SESAME SEEDS!! 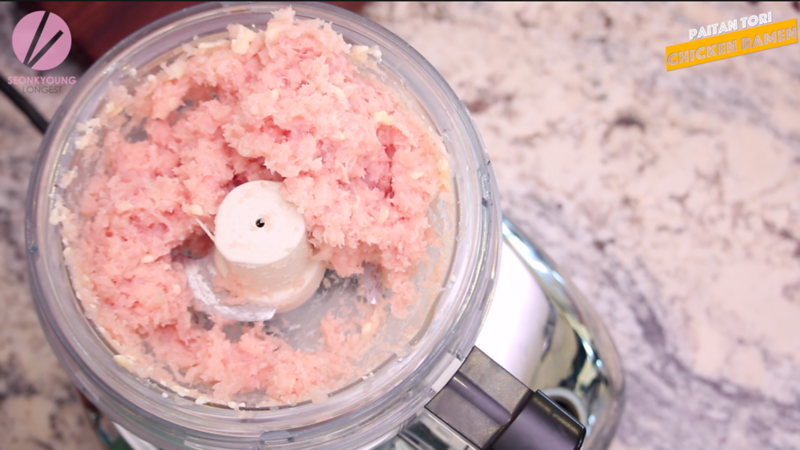 ), I used this Japanese grinder! It’s small but works the magic! Mix well until it’s tacky. Cover with a plastic wrap and keep it in a refrigerator until ready to use. 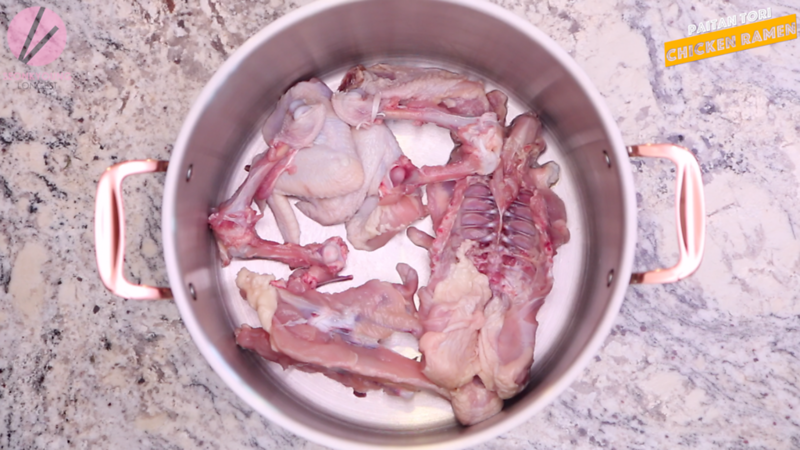 When the chicken broth has only 30minutes left, this is the time start smashing the bones like you mean it! Then pour 1 more coup of water and cover, let it finish cooking. 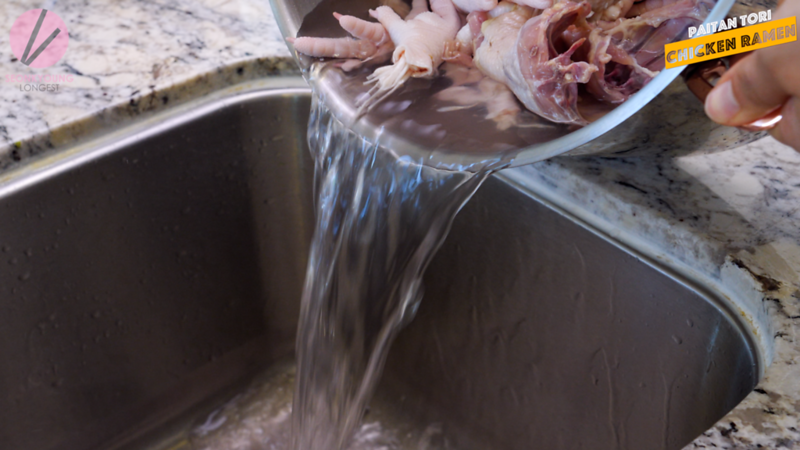 Drain the chicken broth through a strainer and drain one more time with a fine strainer. 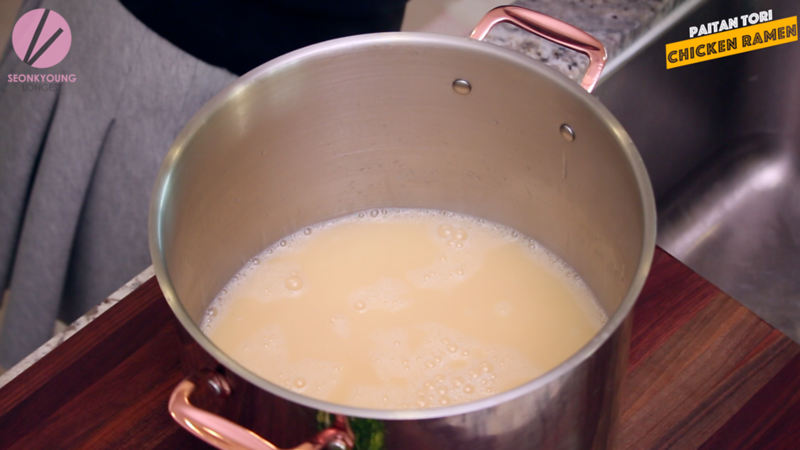 Pour the chicken broth back to the now-clean-pot or a new pot and bring back to boil. When it starts boiling hard over high heat, dropping meatballs by scooping with a melon scoop in to bouth. Also this is time to add chicken powder. 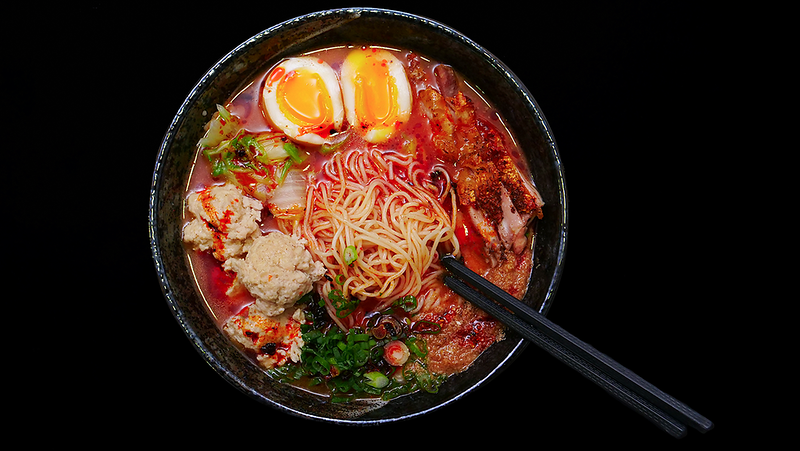 Yes, we worked really hard for this broth, but not hard as the real Japanese ramen masters. Stir to make sure meatballs are not stick to each others. 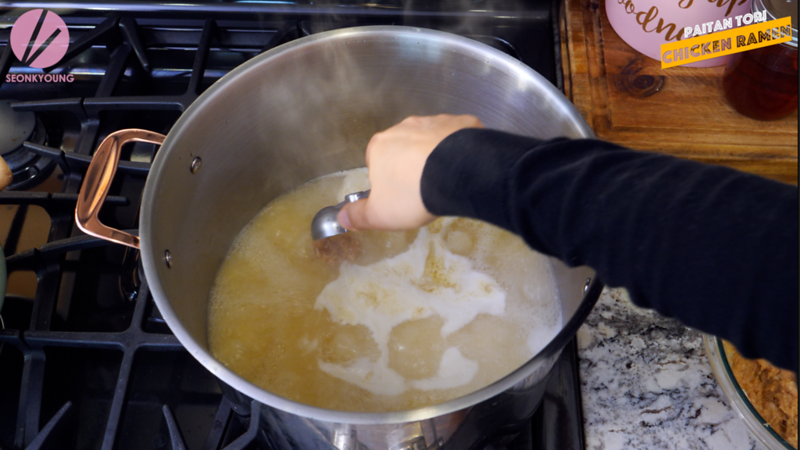 When the soup starts boiling, reduce heat to low and keep it hot. 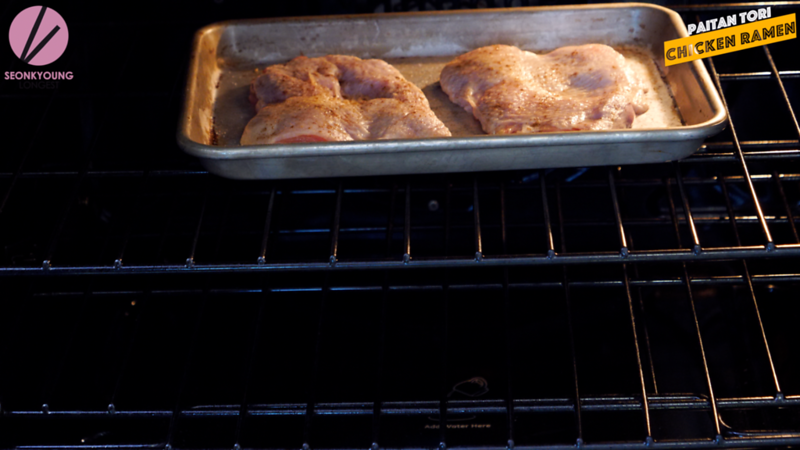 High broil the chicken leg meat (skin side up) on the medium rack for 10 minutes or until chicken is fully cooked. Slice chicken chashu and set aside. 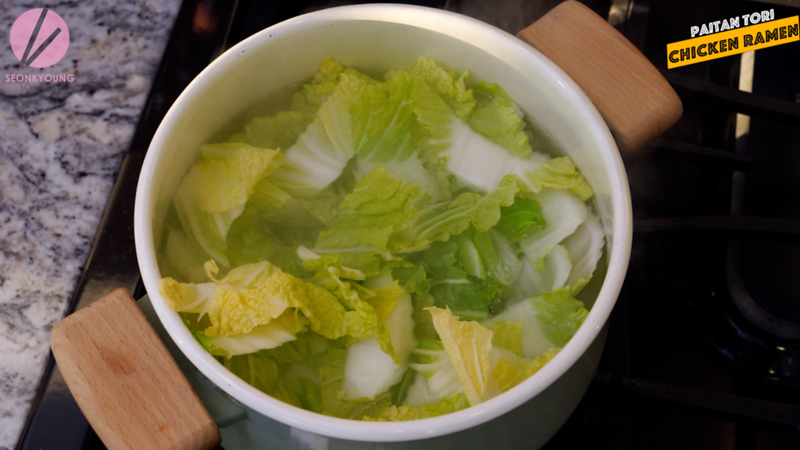 Blench napa cabbage in salted boiling water. 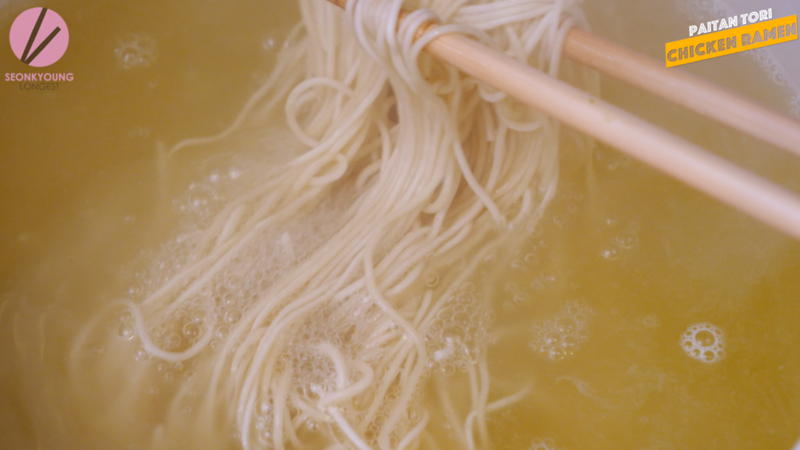 Cook ramen noodles in the same salted boiling water by following the directions of the package you are using. Drain. Pour 1/4 cup to 1/3 cup of tare (depending on how salty you like your ramen to be) and hot chicken broth into serving bowls. 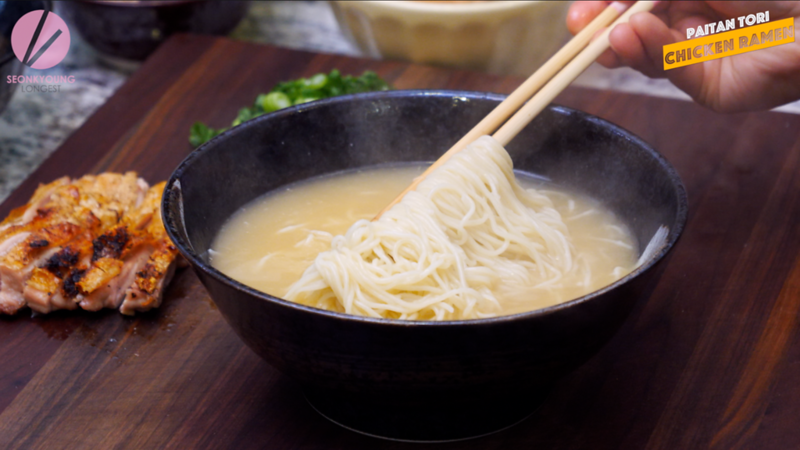 Add noodles into bowls and stir so the noodles will coated evenly with the broth. 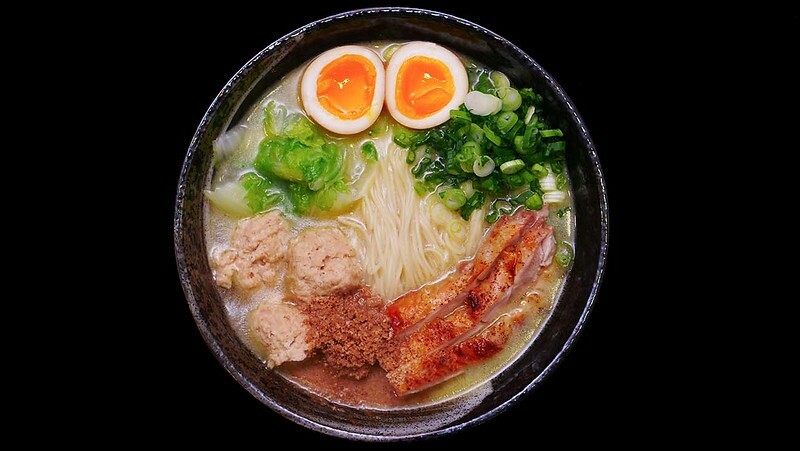 Arrange the blenched napa cabbage, meatballs, chicken chashu, green onions, ground sesame seeds and egg on top of the ramen. Add yuzukosho or chili to your taste. Enjoy! 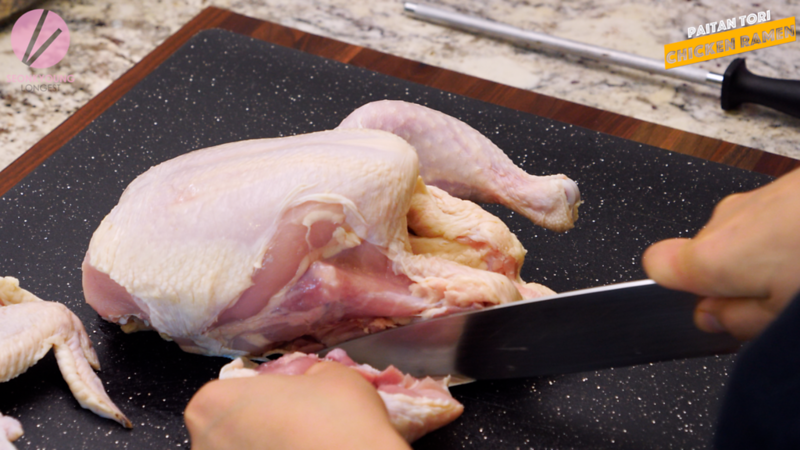 First thing is first, let’s cut up our whole chicken! Make sure sharpen your knife for easier process! 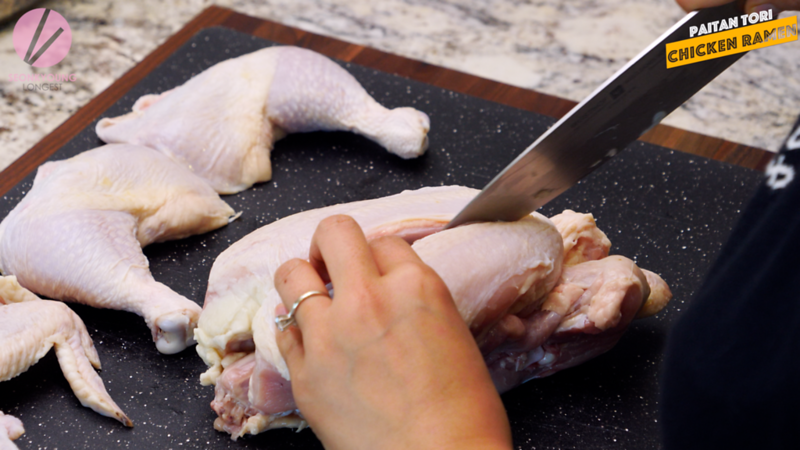 With the chicken backbone side up, pull each wing away from the body, cut through joint and detach the wings completely. Place the back bone, the breast bone, the wings, the leg and the thigh bones to a large pot along with chicken feet and extra back bones. 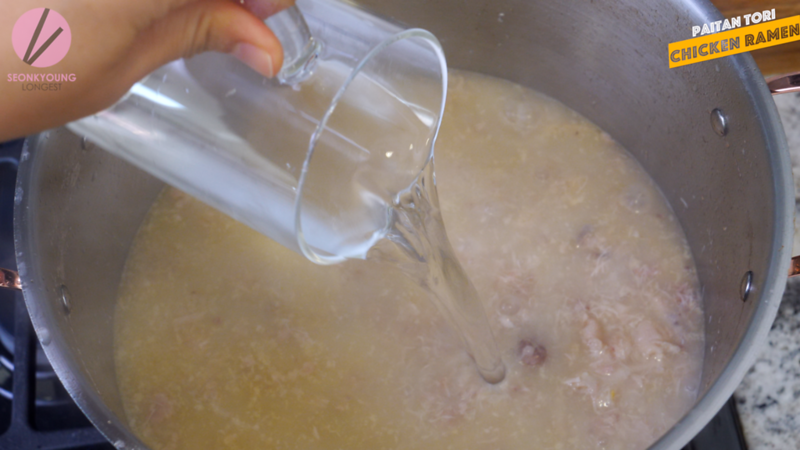 Pour enough cold water to cover the bones and let it soak for 30 mins. Drain and rinse one more time then drain completely. 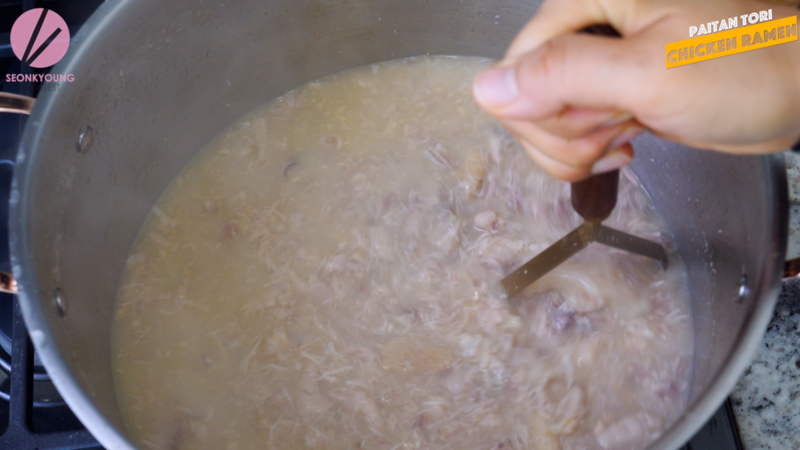 Now, pour 25 cups water and 1 cup sake to the chicken and bring it to boil over high heat. 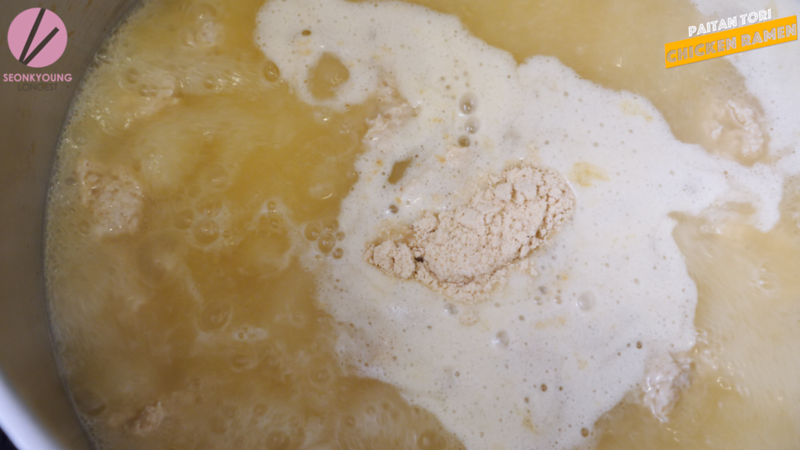 When it starts boiling you will see lots of scums and dirty foams, so skim out all with a skimmer. It will takes about 10 to 15 minutes. 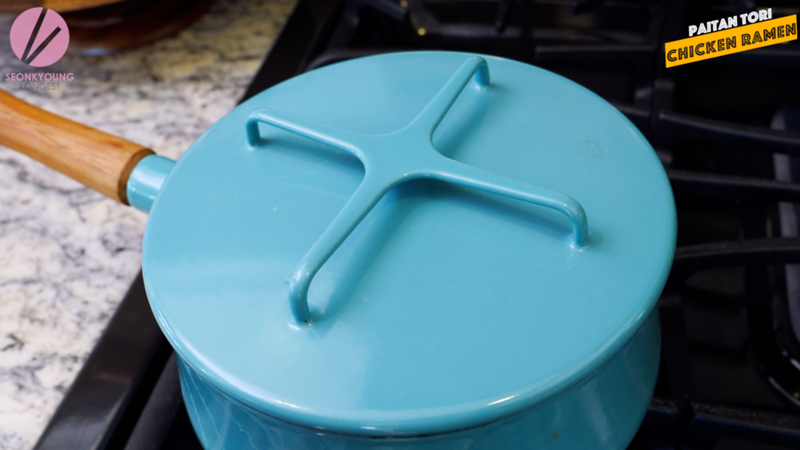 Reduce heat to medium, cover and let it simmer for 5 hours. After 3 hours by, start smashing the bones with a potato masher every 30 minutes. 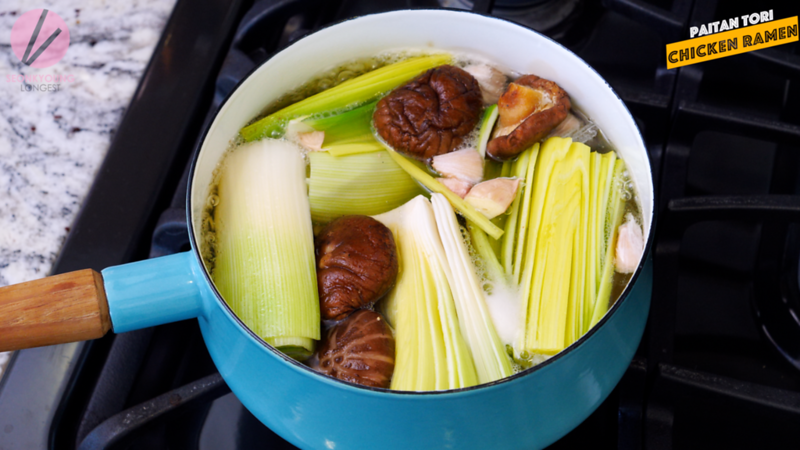 In a pot, place all the ingredients for the tare and bring it boil over high heat. 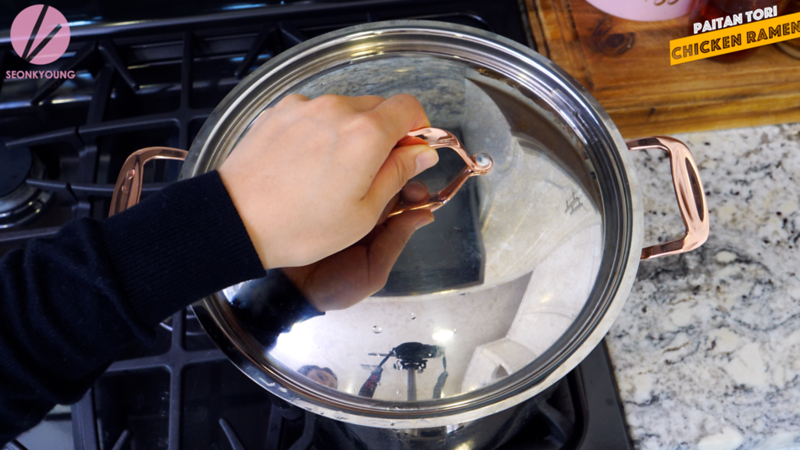 Let it hard boil for 10 minutes then reduce heat to medium, cover and simmer for 1 hour. Remove from the heat and let it cool slightly. Drain through a fine strainer and squeeze all the juice out form the veggies. 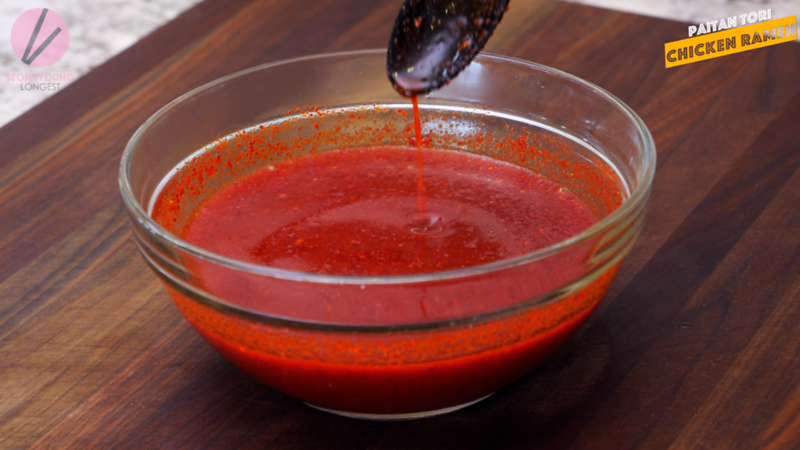 This is shio tare (salt tare) and if you want to make spicy tare as well, add 4 tablespoons of guchugaru to the half of tare in a separated bowl. Transfer ground chicken to a mixing bowl, and add garlic, ginger, starch, soy sauce, mirin, black pepper, egg and ground sesame seeds. Mix well until it’s tacky. Cover with a plastic wrap and keep it in a refrigerator until ready to use. 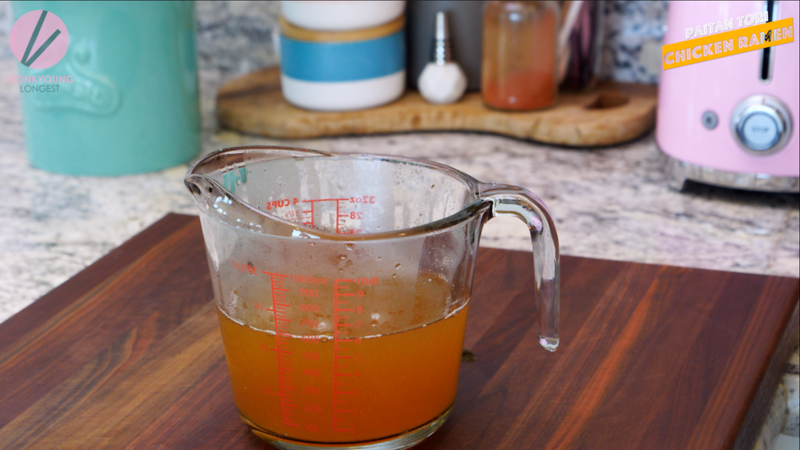 When the chicken broth has only 30minutes left, this is the time start smashing the bones like you mean it! Then pour 1 more coup of water and chicken powder. Cover, let it finish cooking. 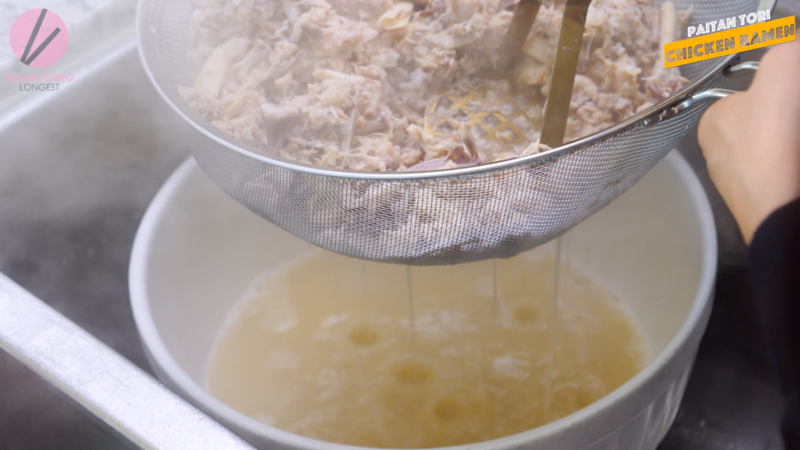 Drain the chicken broth through a strainer and drain one more time with a fine strainer. 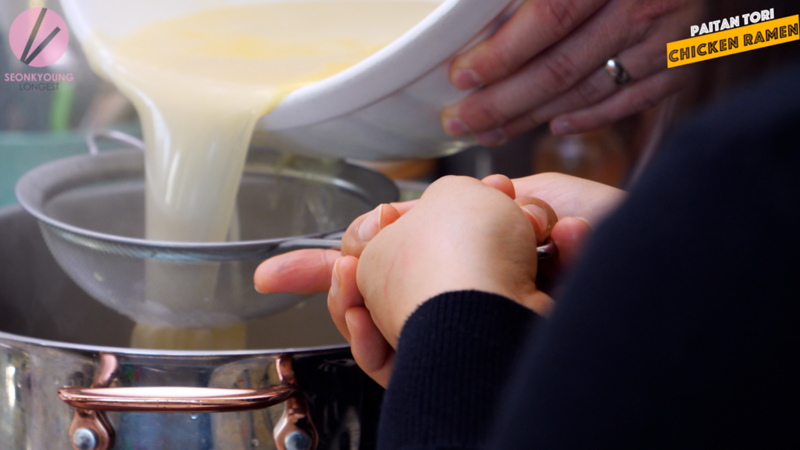 Pour the chicken broth back to the now-clean-pot or a new pot and bring back to boil. When it starts boiling hard over high heat, dropping meatballs by scooping with a melon scoop in to bouth. Stir to make sure meatballs are not stick to each others. 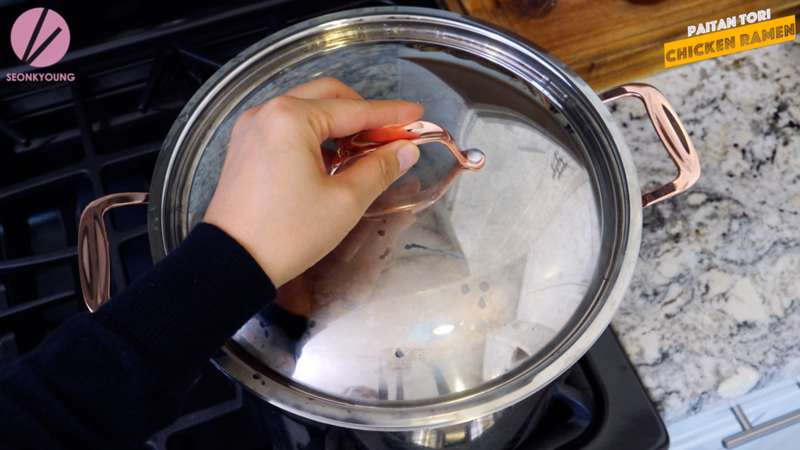 When the soup starts boiling, reduce heat to low and keep it hot. 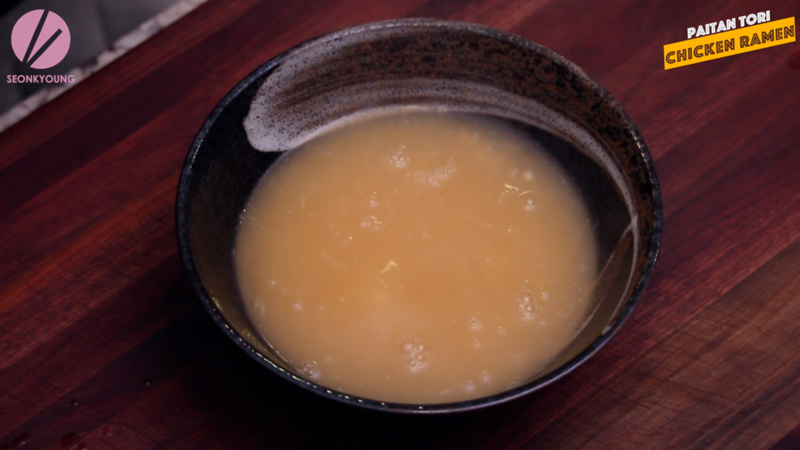 Pour ¼ cup to ⅓ cup of tare (depending on how salty you like your ramen to be) and hot chicken broth into serving bowls. 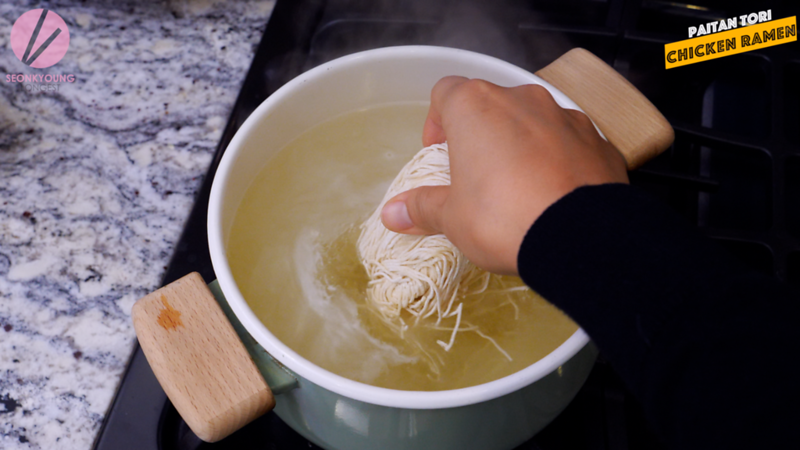 Add noodles into bowls and stir so the noodles will coated evenly with the broth. I love your recipes! I’ve tried a few of them and they were delicious! I really want to try this chicken ramen recipe, but I’m kind of a wuss when it comes to chicken feet. I don’t think I can get past… those little feetsies. What should I do instead? 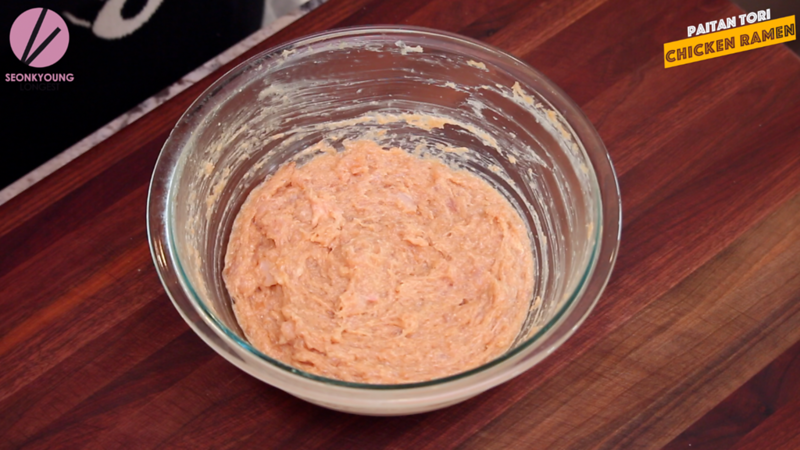 I’m making this right now and I’m really excited to try it tonight, it smells amazing! 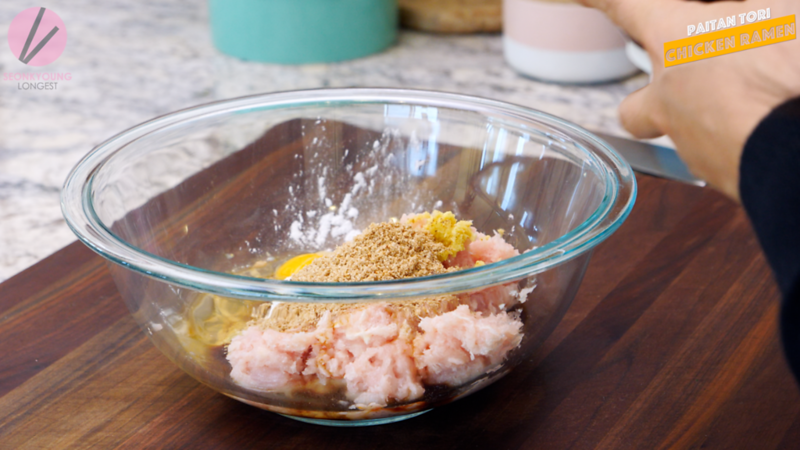 I have one question: In your photo story you say, “Also this is time to add chicken powder,” but the recipe at the bottom doesn’t list or explain the chicken powder. 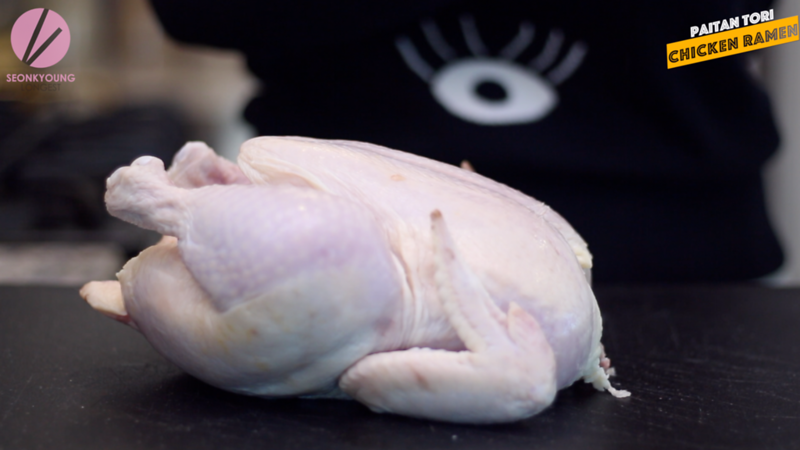 What is chicken powder and how much should be used? Is there a brand name for this chicken powder that you are using, I’m looking in stores and can’t seem to find it? Where can I find the noodles for this recipe? Japanese market at frozen or refrigerator section will be the best option! If you don’t have local Japanese market, try the dried ramen noodles! It works as well! Thank you for this recipe. I would like to know how much stock I am to expect once the cooking is done. I want to ensure I have the correct mouth feel and taste to me as close to yours as possible. Hi, I was wondering how big is your pot (8qt or 12qt)? My pot doesn’t have the info and don’t remember what it was when I purchased. I guess around 10qt? ?